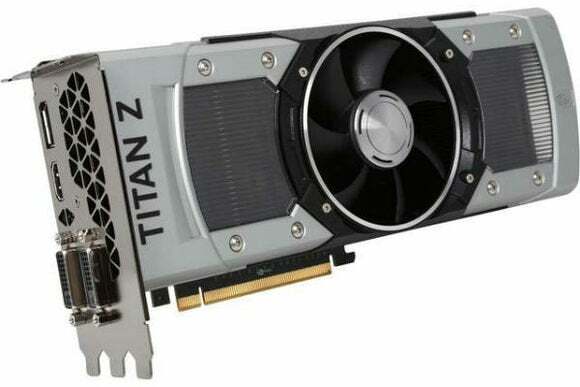 It took a couple months longer than expected, but Nvidia's flagship GeForce Titan Z graphics card has arrived. The Titan Z aims to double the performance of last year's Titan Black GPU by combining two graphics chips onto a single card. As such, it has twice the number of CUDA cores (at 5760), texture units (480) and render outputs (96) as the Titan Black. It also has twice the amount of video memory, at 12 GB, and twice the memory bandwidth at 672 GB per second. What does all that extra power get you? Nvidia says the Titan can handle “even the most insane multi-monitor displays and 4K hyper PC machines.” Outside of the gaming realm, Nvidia has also claimed that just three Titan Zs can power Google's effort to model the human brain. To use the Titan Z in your rig, you'll need two 8-pin power connectors, and a power supply that can handle 375W. For monitor outputs, Nvidia is using one each of DVI-I, DVD-D, DisplayPort and HDMI. You'll also need some pretty deep pockets, as Nvidia is sticking with its originally-announced price of $3,000, making the Titan Z the company's most expensive graphics card ever. If you can deal with a mere (ha) 8 GB of memory and a power draw of 500W, AMD's custom water-cooled Radeon R9 295 X2 may be a compelling alternative. At $1500, AMD's own dual-GPU card is half the price of Nvidia's latest flagship and absolutely chews through gaming and compute tasks. Otherwise, you can pick up the Titan Z from Amazon, Newegg or TigerDirect now. It'll also pop up in high-end rigs from system builders such as Origin, CyberPowerPC and Digital Storm.